I am so jealous. Can I live by a lake, far from town, surrounded by trees, chipmunks and birds? 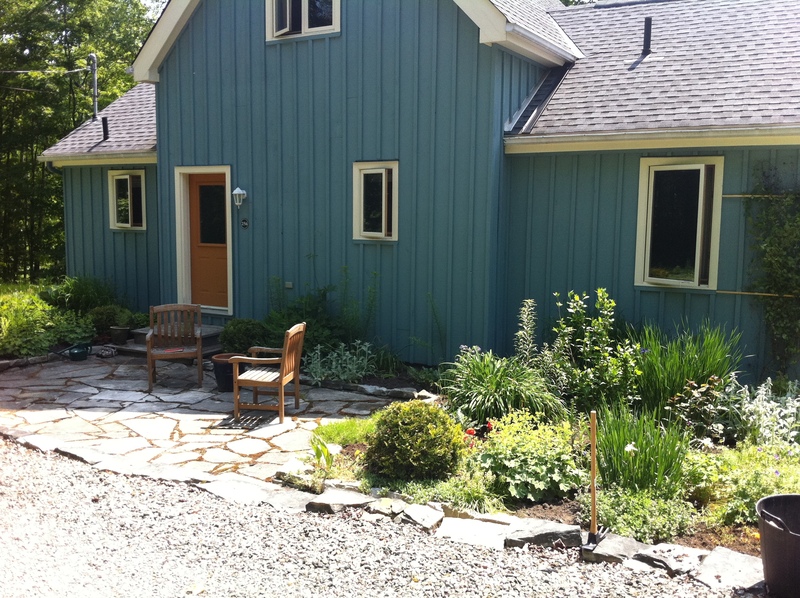 In a beautiful little blue house, with gardens all around? But wait, there is a problem: the stone walls holding this jewel-box house on the hillside have been built by someone not qualified to do such a serious job — just how unqualified they were rang true when they began to dislodge, exposing the glue (yes, I said glue) that held one course to the next. Enter Jo Hodgson, who was trained or more likely, had the skills of dry stone walling imprinted on her soul in the Derbyshire Dales of England. Last year she began the transformation here at Jeff’s house: look here for the first chapter. But of course before the work could be done (or re-done properly), things had to be undone. And slowly, surely, and magically the new walls took shape. 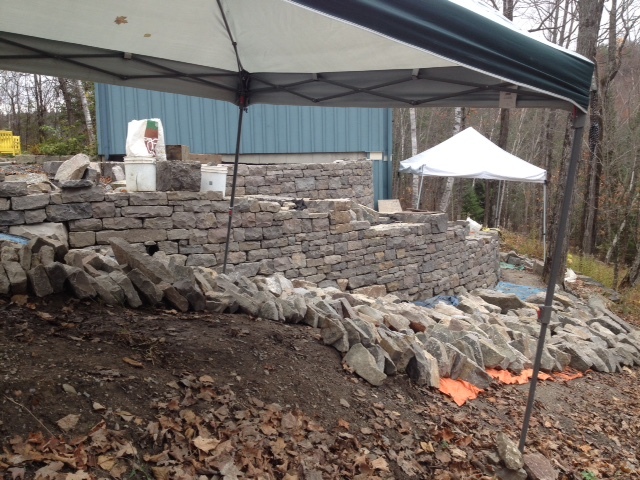 The walling job that Jo has been working on this year at Jeff’s house in the Quebec countryside is monumental, probably one of the most challenging she has done, Jo says. 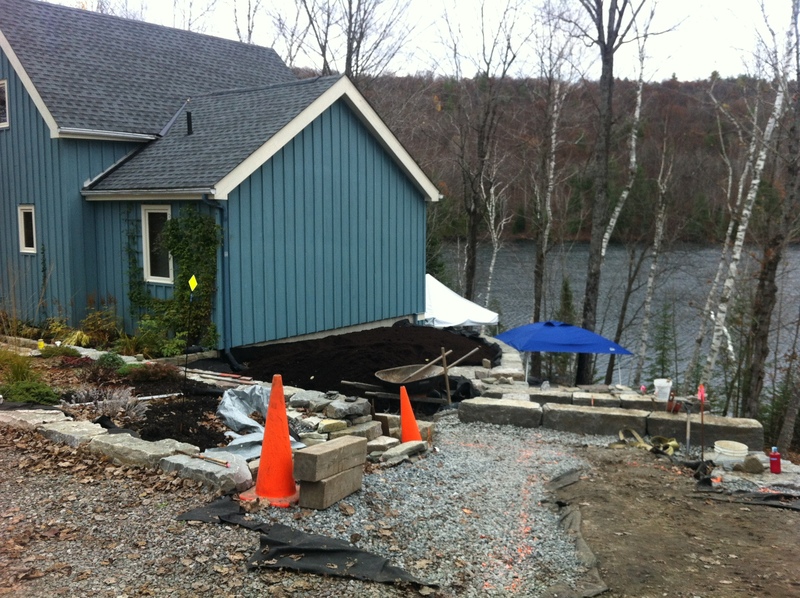 The house is perched on a hillside overlooking a picturesque, quiet lake with the front door off the road and the rear sliding doors a full eight feet below that grade. So the wall at the rear corner of the house is tall, to be brief, and the stone steps that hug it are built into that elegantly curving wall. 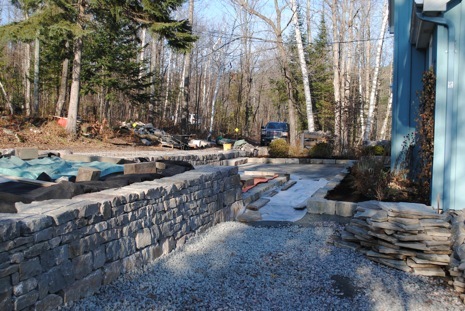 On the inside of this solidly built retaining wall is a garden that will become a hot bed of reds, oranges, golds and sapphires. It will encircle a small round lawn — hard to imagine at this stage so I will have to return next summer to show it to you in all its glory. It will be the primary garden that visitors will see as they approach the house. The giant steps that descend toward the the rear of the house hug the wall and will be planted with mother-of-thyme, a perennial that can be tread upon without fear of harm. 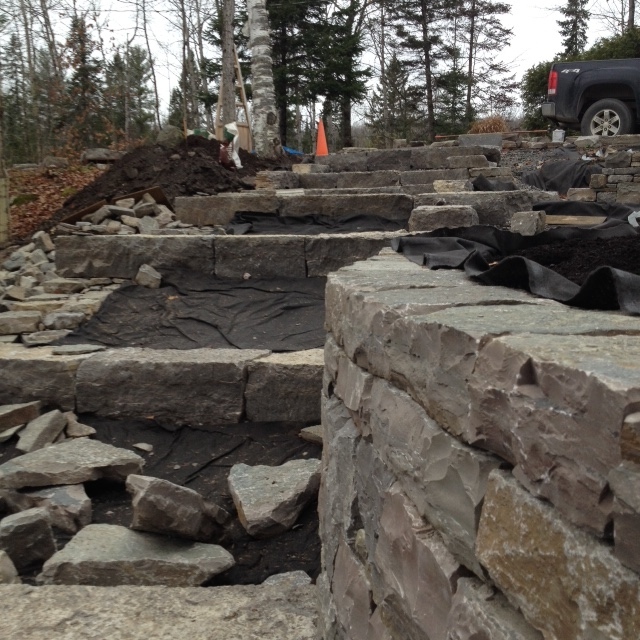 Rather than the rich soil which has been deposited in the garden beds, these stair sections will be filled with recycled earth, rocks and all, allowing the plants to thrive in the thin soil they prefer. 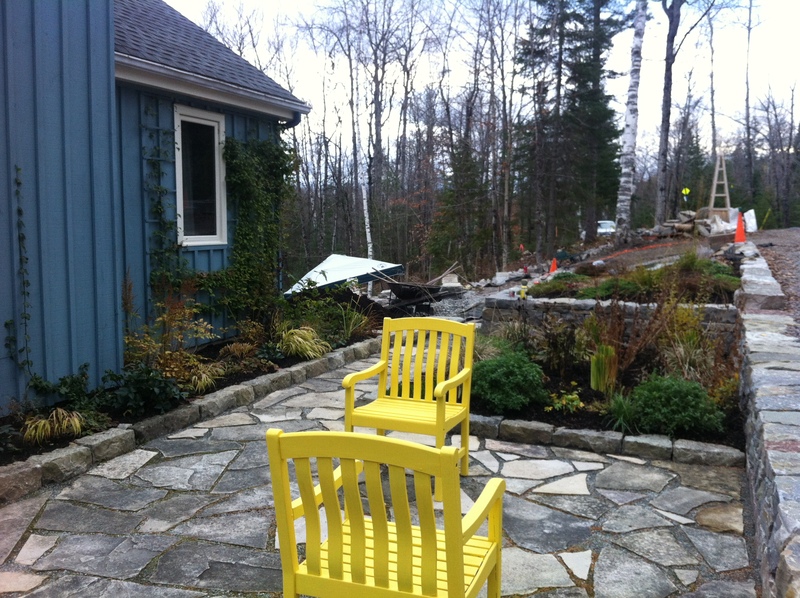 This wondrous new landscape, with walls borne out of magic, sweat, vision and grit, and gardens providing pleasure in all seasons, is Jeff’s retirement present to himself. And the gardens will indeed consume him. And if I’m lucky, I’ll be invited back next year when all is complete. And I will share with you his completed private paradise. my friend had a similar rock wall installed at her home and I loved it. add so much to the property, doesn’t it?